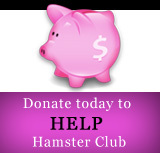 Hamster Club :: Justin Bieber, Hamster Hater? Justin Bieber gave one of his fans a special souvenir at his Atlanta concert earlier this month when he handed over Pac, the hamster he'd kept as a pet since October. The lucky Belieber who�s Pac's new owner, 18-year-old Victoria Blair, reveals that the cute critter is still living the good life � even without Bieber by his side. 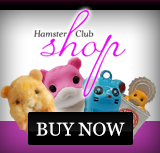 "I worship that little hamster � I love him," Blair tells Celebuzz, adding that Pac's acting like "a normal hamster." "I bought him a ball and he runs around. He stays right beside my bed. He'll wake me up and roll around. The next big thing I'm going to get is a hamster playground," she says. Blair strives to give Pac a life similar to the one he had with Bieber. "Pac is used to being on the road, and that's exactly what I'm doing,� Blair notes. "I'm going to do with Pac what Justin would do and try to be a similar environment like Justin did. Justin took him to meet his fans. So I take him to the park and I let people pet him. The other day, I let Pac go with me to the pet store. He goes with me everywhere. He's like my baby." 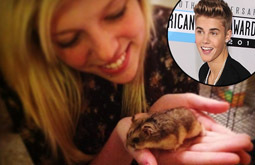 Though Pac is very lucky to have Blair as an owner, the California Hamster Association was not happy when Bieber gave his pet away two weeks ago, saying that the singer committed animal cruelty by unloading the little guy (we also agree to this statement). Our opinion: Hamsters are not meant to travel constantly and thus we do not agree with Blair's choice of allowing Pac to live a 'similar life' that it 'had' with Justin Bieber. No pet, large or small, should ever be 'gifted' to an unknowing recipient.